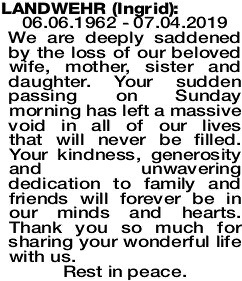 06.06.1962 - 07.04.2019 We are deeply saddened by the loss of our beloved wife, mother, sister and daughter. Your sudden passing on Sunday morning has left a massive void in all of our lives that will never be filled. Your kindness, generosity and unwavering dedication to family and friends will forever be in our minds and hearts. Thank you so much for sharing your wonderful life with us. 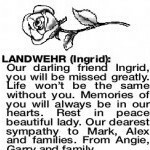 The Funeral Cortege for Ingrid Landwehr of Murdoch will arrive at FREMANTLE Cemetery, Carrington Street, Palmyra at 12pm on MONDAY (15.04.2019) for a Cremation Service. Please assemble at the Carrington Pavilion at 11.50am. 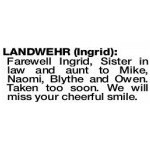 Ingrid, you were taken too soon. You will be so missed,esp at Nedlands. Deepest sympathies to Mark and Alex. 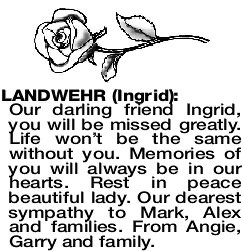 LANDWEHR INGRID Farewell Ingrid, Sister in law and aunt to Mike, Naomi, Blythe and Owen. Taken too soon. We will miss your cheerful smile. 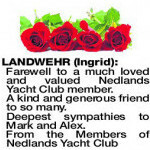 Our darling friend Ingrid, you will be missed greatly. Life won't be the same without you. Memories of you will always be in our hearts. Rest in peace beautiful lady. Our dearest sympathy to Mark, Alex and families. From Angie, Garry and family. 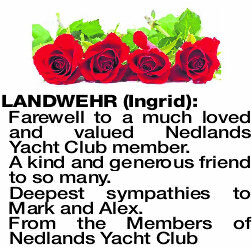 LANDWEHR INGRID Farewell to a much loved and valued Nedlands Yacht Club member. A kind and generous friend to so many. Deepest sympathies to Mark and Alex.